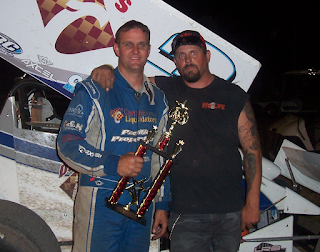 David Hibbard continues to roll with his fifth Kendall Oil Winged Sprint Car win. White City, Oregon...July 14...Point leader David Hibbard won his fifth 25 lap Kendall Oil Winged Sprint Car Main Event of the season. Jeffrey Hudson led at the start as Hibbard ran third. An inside pass on the back stretch on lap eight gained Hibbard second from Charlie Thompson, and he made a similar move two laps later to grab the lead from Hudson. Once he got the lead, David Hibbard pulled away to the impressive victory. Hudson ran a solid second, followed by Blaine Cory, Charlie Thompson and Bailey Hibbard. 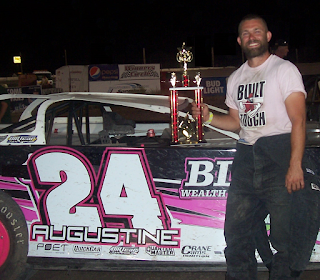 Point leader Nathan Augustine debuted his new car with his second win of the season. Point leader Nathan Augustine made a successful debut of his new car by winning the 25 lap Late Model Main Event. Augustine bolted ahead at the start, but John Dees moved into second. After a lap three caution flag, the rest of the race ran non stop and John Dees pressured Augustine all the way. However, Augustine scored his second win of the season and John Dees settled for his third second place finish. Bob Dees finished third, followed by Dave Foote and Miles Deubert. 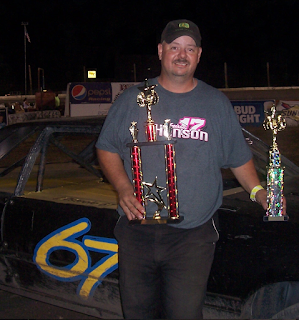 David Steele made his fifth Bobbio's Pizza Mini Stock win a clean sweep performance. 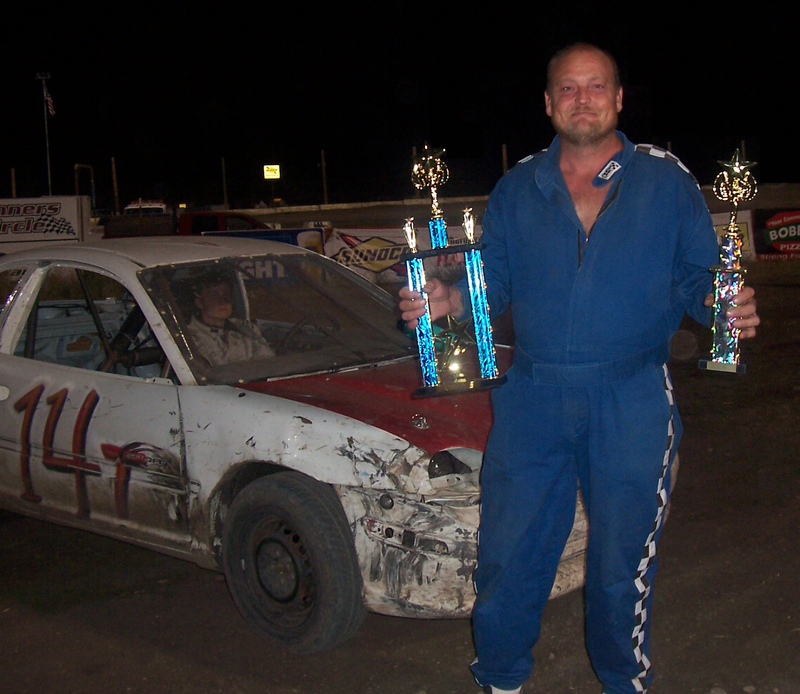 Point leader David Steele continues to roll as he won his fifth Mini Stock Main Event of the season. Steele won his heat and the Trophy Dash and led the Main Event from the start. A yellow flag flew with two laps to go, but Steele continued his rapid pace on the restart and won ahead of Steve Goetz, Kristopher Mix, Garrett Fredrickson and Hunter Magnan. Tim Hedges will likely be the JOAT Labs Hornets point leader after his clean sweep. Tim Hedges won his first 20 lap JOAT Labs Hornets Main Event of the season. Hedges took the lead from Zach Nelson on the second lap and led the rest of the way. Bree Tritchler came from the fourth row to challenge Hedges before settling for her third second place finish. Dylan Irving, Dylan Sauer and Saundra Hattrick made up the remainder of the Top 5. Racing resumes next Saturday night with IMCA Modifieds, IMCA Sport Modifieds, SODCA Dwarf Cars, Valley Stor-All Late Model Lites and OTRO Hardtops. There will also be an Outlaw Kart race on the little track on Friday night. For further information, go to www.southernoregonspeedway.com. Heat Winners (10 Laps)-Camden Robustelli, Jeffrey Hudson. Scramble (8 Laps)-Jeffrey Hudson. Main Event (25 Laps)-David Hibbard, Jeffrey Hudson, Blaine Cory, Charlie Thompson, Bailey Hibbard. Heat Winners (6 Laps)-Nathan Augustine, John Dees. Trophy Dash (4 Laps)-John Dees. Main Event (25 Laps)-Nathan Augustine, John Dees, Bob Dees, Dave Foote, Miles Deubert. Heat Winners (6 Laps)-David Steele, Steve Goetz. Trophy Dash (4 Laps)-David Steele. Main Event (20 Laps)-David Steele, Steve Goetz, Kristopher Mix, Garrett Fredrickson, Hunter Magnan. Heat Winners (6 Laps)-Zach Nelson, Dylan Irving. Trophy Dash (4 Laps)-Tim Hedges. Main Event (20 Laps)-Tim Hedges, Bree Tritchler, Dylan Irving, Dylan Sauer, Saundra Hattrick.